Group skating. This is where large groups of skaters skate together on the streets. Jam skating. This is based on the music and can either be choreographed or non choreographed. We are going to give you a little background on jam skating. Jam skating is a combination of dancing, gymnastics and roller skating. 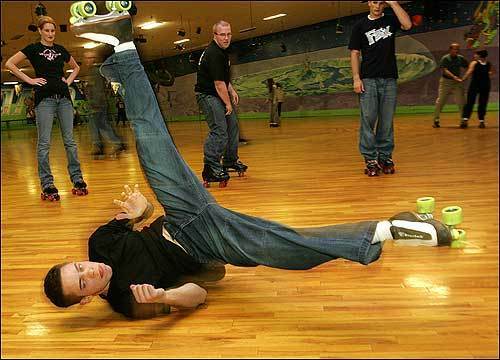 Jam skating originated in the disco era but gained popularity during the 90’s because of the style of music and evolution of break dancing during the decade. There are dozens of tricks and moves associated with jam skating. However, there are four main styles that are the most well-known. First is footwork which focuses on the feet and doing mainly foot and skate tricks. Next is ground breaking which features small movements like toe jumps that do not cover a lot of ground or require a ton of movement. The next style, power, is most like break dancing and includes head stands, spins, and flips. Finally, shuffle skating is skating around the rink, forward or backward, to the beat of the music. Now that you know a little more about jam skating, are you ready to come down to Rainbow Rink and try it out? Every Wednesday night we have our Adult Retro Night filled with fun music from the last 40 years and adult beverages. Check out our full schedule for theme nights, family skates, and much more.